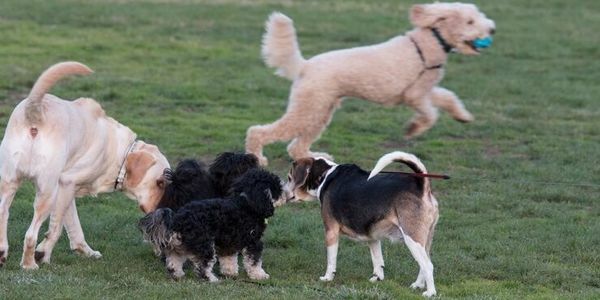 For years dog owners have been bringing their dogs to Jollyman Park for off-leash exercise and socialization, near the far back grounds (baseball and soccer area) with no incidents of nuisance or complaints from the community. We are responsible dog owners who clean up after our dogs and make sure the dogs are well behaved and do not interfere with ongoing activities. Since there is an on-leash law throughout Cupertino, dog owners are getting ticketed for such off-leash dogs. Due to geographic limitation such as small yards and condo living, pet owners need to get the City of Cupertino and our representatives on board to allow us the freedom to exercise, solcialize, and play freely but responsibly in our Jollyman Park an hour before and after sunset. Cities like Mountain View (http://www.mountainview.gov/depts/cs/parks/dogs.asp) and San Jose (https://www.sanjoseca.gov/Facilities/Facility/Details/140) already have this ordinance in place in some of their regular parks. The goal with this petition is to raise awareness about the need for off-leash hours that will benefit all users of the park resources. We are asking the City Council to provide for off leash hours (one hour before and after sunset) at Jollyman Park in a safe and community oriented way. Jollyman park is uniquely suited for this, since the south west area of the park is already fenced in and reasonably secure for dogs. Please attend and show your support!! UPDATE: Most of the dog owners are meeting the Cupetino city parks and recreation committee to submit the petition and proposal on Jan 4th, 7pm at Cupertino City Community hall, 10350 Torre Avenue, Cupertino, CA 95014. Please be present to show your support for this important cause!! Each and every person’s presence counts!!! Our strength is in numbers!! Please mark your calendars JANUARY 4th @ 7 pm at CUPERTINO CITY COMMUNITY HALL, 10350 Torre Avenue, Cupertino !! !